Not all vehicle accidents involve more than one vehicle. Phily accident lawyer wants motorcycle drivers to understand what to do if they are in a non-contact, or one-vehicle, accident. Another driver can be held liable for a motorcyclist’s property damage and injuries when they are responsible for an accident, even if his or her vehicle did not actually come into contact with the motorcycle. The key to these types of cases is whether the other driver was negligent. What is Negligence in a Non-Contact Motorcycle Accident? In basic terms, negligence in auto accidents occurs when a driver doesn’t exercise reasonable care. It is based on what attorneys describe as the “reasonable person” standard. This standard is defined as what a reasonable person would have done in the same situation. If a driver does not take that action and an accident occurs, then it is considered negligence. Conversely, if a reasonable person wouldn’t have taken a specific action, then doing that action would be considered negligent. To determine whether someone acted negligently, a jury (and insurance company) looks at all the circumstances relating to the driver’s actions. Typically, drivers’ responsibilities are twofold – to obey traffic laws and to be aware of what is happening around them. They must keep an eye out for other vehicles, traffic signals or other devices, pedestrians, etc. If a driver doesn’t notice or fails to see what is plainly there to be seen, and then respond reasonably, then he or she will probably be found negligent. 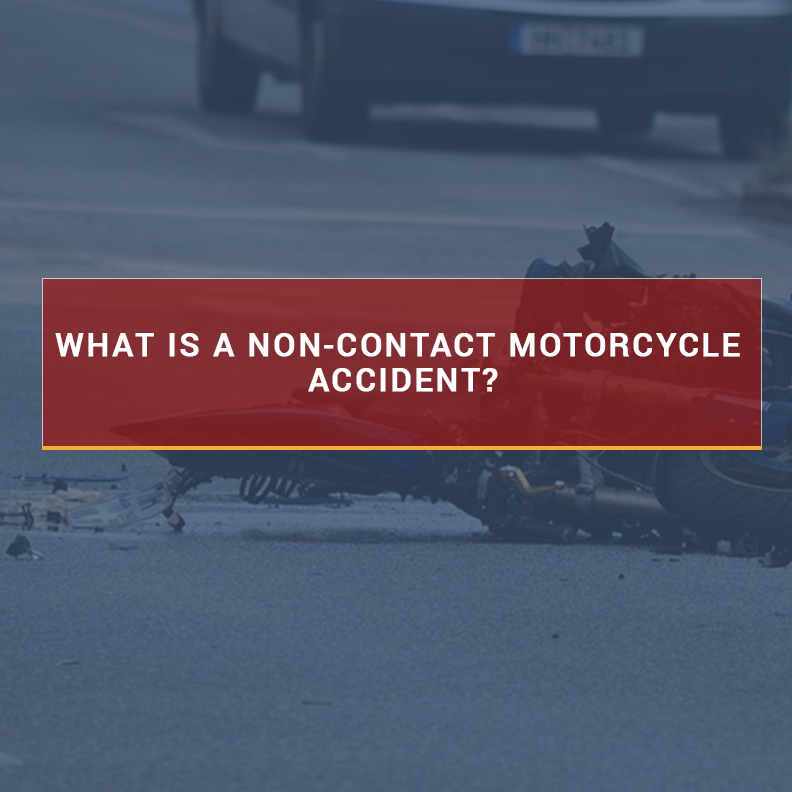 What is a Non-Contact Motorcycle Accident? There are many ways that a non-contact motorcycle accident can occur. For example, imagine a car and motorcycle are driving in the same direction in separate lanes on a two-lane road, with the car a little bit ahead of the motorcycle. The car changes lanes quickly without signaling or giving other notice to the motorcycle driver. The motorcyclist then has to swerve to avoid being hit by the car, loses control, and crashes. There was no contact between the car and the motorcycle, but there was an accident that occurred due to the car driver’s negligence. Non-contact motorcycle accidents are the same as other types of vehicle accidents. The question isn’t whether two vehicles collided, but rather that someone was driving negligently. The main thing to remember is that if the negligence of another driver causes a motorcyclist to wreck, the driver will be liable for the accident, even if his or her car never touched the motorcycle. If you or a loved one has suffered injuries caused by a non-contact motorcycle accident, contact a motorcycle accident lawyer near Philadelphia.